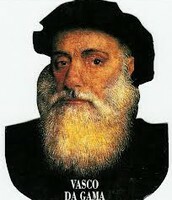 Vasco da Gama was born to a noble family in 1460 in Sines, Portugal. He, later, joined the Navy where he learned how to navigate the seas. 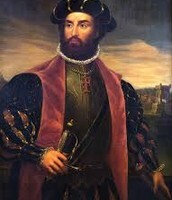 Da Gama secured his reputation as a sailor when, in 1492, King John II of Portugal dispatched him to the south of Lisbon to seize French ships as an act of vengeance against the French government for disrupting Portuguese shipping. Following da Gama's completion of King John II's orders, in 1495, King Manuel took the throne, and the country turned back to its earlier mission to find a direct trade route to India. Portugal had established itself as one of the most powerful maritime countries in Europe. 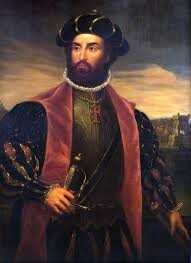 After his expedition to India in 1497, da Gama returned a hero. Married at this time, and the father of six sons, da Gama settled into retirement and family life. He maintained contact with King Manuel, advising him on Indian matters, and was named count of Vidigueira in 1519. Late in life, after the death of King Manuel, da Gama was asked to return to India. In 1524, King John III named da Gama Portuguese viceroy in India. The same year, da Gama died in Cochin from possibly overworking himself. 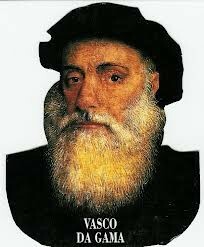 His body was sailed back to Portugal, and buried there, in 1538. 1. He helped established Portugal as a world power at this time. 2. 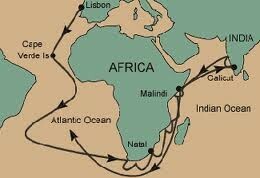 He established the route to India that people still use to this day. 3. He recommenced trading between Portugal and India, making his country rich. 4. He helped re-establish trade between Asia and Europe.